After you have finished testing and managing any issues involved with your project, you are ready to deploy your course for the use of your learners. 1. After logging in, locate the project you are ready to deploy from the "My Projects" tab. Click on the purple circle with the arrow to the right of the project name. If you are already viewing your project from the "Project Home" tab, you can click on the "Deploy The Course" icon. 2. At this point you have to decide on the form of deployment: either your learners will access the course from your website or LMS, or you will provide them a public link to the course that is located online on Unison. Instructions for both forms of deployment are given below. If you decide to deploy the course to your website or your LMS, you will actually end up with a file that you will later have to transfer to your website or LMS. The advantage of having your course on the LMS is that your LMS will receive data about the progress of your learners during the course. If you decide to send your learners a link to the course on Unison, the only way you will receive data about your learners is if you have allowed them the option of emailing you their scores. Otherwise they will navigate and complete the course without you receiving any information. 1. 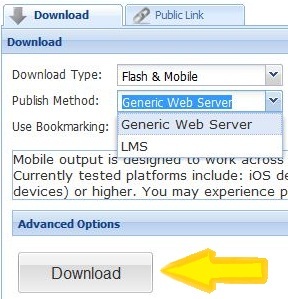 If you decide to download the file for future upload to your website or LMS, click on the "Download" tab. 2. Select the format of your course in the pull down tab. 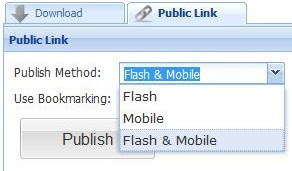 You have the option of flash, mobile, or flash & mobile compatible. 3. Click on the pull down tab next to "Publish Method" to select the location to which you will publish, either a "generic Web Server" or "LMS." 5. Transfer the file to your website. The course will now appear on your desktop as a file. This file is ready to be transferred to your LMS or your website. 1. Click on the public link tab instead of the download tab. 2. Select the format of your course in the pull down tab next to "Publish Method." You have the option of flash, mobile, or flash & mobile compatible. 4. 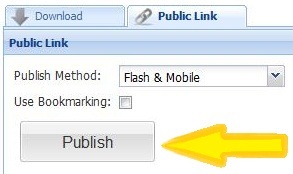 Copy the link that appears directly below the "Publish" icon. 5. Paste the link to your website or the email form given below the link. Add in the email addresses of your learners and hit send to email the link to them.